From Uzbekistan comes this somewhat forgotten album of exquisite and delicate folk fusion. 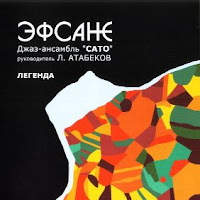 Driven mostly by acoustic guitar and woodwinds, the albums' six tracks stretch somewhere between the territories of acoustic jazz and the realm of odd guitar experimentation, yet all have a strong and dense flavour of the traditional music of Uzbeks and Tatars. The band I believe to have originated from the Fergana Valley - which was a melting pot of the Soviet Middle Asia - and the cultural and ethnic diversity of the group members has obviously contributed to the polystilistic character of the music. Enver Izmailov, Sato's guitar player who is said to have independently discovered the touch/tapping technique in the late 70s (i.e. simultaneously with Stanley Jordan), has made a succesful solo career after the group disbanded. His later works were more along the lines of 'Legend' and 'Boyna' and featured multilayered guitar improvisations on Eastern folklore themes. Thanks alot for this one. It is nice that you find and post music from the non western areas of the world...!!! Agree wholeheartedly with Jonas. Amongst a lot of treasures (well maybe) this is the one I'm most eagerly anticipating.